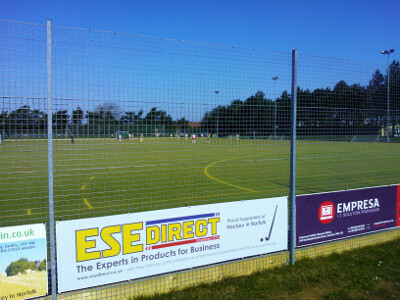 ESE Direct are delighted to be able to help out Norwich City Hockey club with some much needed funds and equipment, as the club attempts to establish itself as the best in the county. The Industrial supplies based company have taken out a new advertising board on the astro pitch at Norwich City Hockey Club’s base and have also agreed to provide outdoor litter bins to place around the pitch, ensuring supporters look after the environment and keep the pitch clean. Simon Francis of ESE Direct said: "Coming from a hockey family myself we’re delighted to support our local club. Hockey is a sport which sometimes doesn't get the interest it deserves, it's a great way of getting fit, learning to work as a team and make friends. We wish all teams at Norwich City a really successful summer as they prepare for the new season ahead."